A fine dining four course menu. Prawn cocktail baby gem cups with thousand island dressing and smoke paprika. Seard scallop, parsnip purée, smoked bacon powder, orange and hazelnut dressing. Sweet bread with veal demi glace, sauté morels and shallot. Creamy parsnip and apple soup with parsnip crisp. 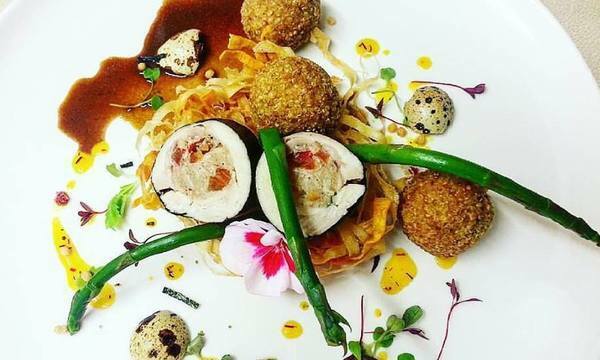 Crab and cranberry stuffed pheasant ballotine wrapped with nori in crispy parsnip nest with quinoa crusted surprise croquettes(quail scotch egg, truffle creamed sweet potato and shredded brussel sprout and panchetta). Grilled fillet of halibut with pumpkin & shrimp risotto and lemon butter sauce. black forest gateau served with raspberry sorbet. 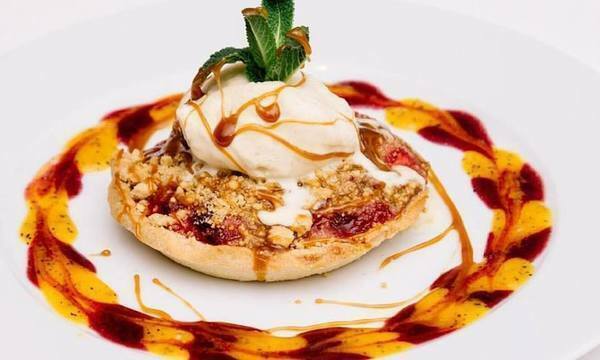 Plum and cardamon crumble tart with white chocolate ganache. Absolutely sensational food, don't hesitate to book Tim. Having read the reviews here I decided to ask Tim to cook a meal for 5 people for my Mum's special birthday. We were all totally amazed with his food and had a really wonderful time. The food was so professionally presented and we were so overjoyed with the flavours and tastes, absolutely blown away by every course. Tim is a fantastic chef and I absolutely recommend him without any hesitation whatsoever. He really made the meal a really special occasion. On top of that you just won't meet a nicer bloke - he is really professional and very warm and friendly. The whole occasion turned out even better than we ever hoped for thanks to Tim and his wonderful food. Thank you so much Tim.